By mid-March the majority of paddy farmers have completed harvesting their Maha crop; some with financial issues have already disposed their stocks to middlemen. Others are fighting to get a reasonable price for their stocks. The Paddy Marketing Board announced that it has commenced purchasing paddy from farmers and by 11 March had purchased 400,000kg of paddy at a maximum of 2,000kg paddy per farmer, meaning PMB has purchased paddy from 200 farmers. The balance stocks need to be sold to rice millers or their agents who pay a lesser price than the PMB. Two weeks ago there were two ministerial committees arguing on the purchase price for paddy. Daily Mirror on 2 March reported, ‘Unidentified pest causes havoc in paddy fields’. 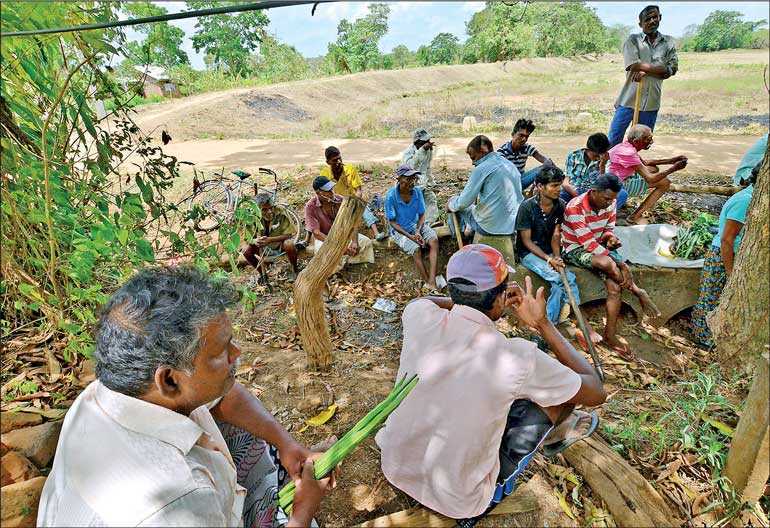 According to the report, an identified pest has caused extensive damage to paddy cultivation on the verge of harvest on the Polonnaruwa District, with over 10,000 acres of paddy cultivation already destroyed by the pest. Farmers pointed out that the pest was spreading fast and they have used every pesticide recommended by the Department of Agriculture to no avail. Agricultural officials claim the prevailing weather in the area has worsened the situation. Meanwhile, Agricultural Instructor M.A.A.S. Swarnalatha said the paddy cultivations in the latter part of the Maha season had been affected by the pest. The pest is the larvae of the Fall Army-Worm moth. It originated in America, perhaps from Chile, has spread to Africa, then India by 2018 and is now found in Sri Lanka. The ‘Army-Worm’ attack on maize, paddy and other crops attracted heavy news coverage from media. But the damage is not bad as feared. In the 2017/18 Maha season, the maize harvest was 274,399 metric tons. The country is forecasted to produce 240,675 metric tons of maize in the Maha season, which is down 12.2% from a year earlier. But other forecasts predict lower figures. Wide-spread pest attacks on paddy and other plantations are mostly due to permitting their easy multiplication of their numbers. Farmers fail to cultivate together as a team, allowing the pest, worm-laying moths, to spread from one field to the other. In the north-east dry-zone, Maha rains arrive normally around 20 September. Prior to rains fields are hard, but after the first few rains, the ground becomes softer, allowing farmers to repair their field bunds damaged during the previous harvesting season. When all openings are closed, with following rains water will get collected and ground would be soft, allowing field preparation by tractors. The procedure allows sowing of seed paddy by early or mid-October, when heavier rains arrive in November rice plants are sufficiently tall to withstand flooding. The process would allow mature paddy be ready for harvesting by mid-January, especially with rains ending with December and January being dry. If the same procedure is followed by all farmers, any delayed farmer could still cultivate a shorter maturing variety and all farms would mature roughly at the same time. Allowing for Yala cultivation by early March, leaving a gap of two months deprives moths of an opportunity to lay their eggs, thus controlling moths and worms. This is the very reason Agricultural Instructor M.A.A.S. Swarnalatha informed that “the paddy cultivations in the latter part of the Maha season had been affected by the pest”. Decades ago, cultivation societies at village level used to meet and agree on the paddy cultivation days based on rains. Now, especially in regions with extensive irrigation facilities as Polonnaruwa, cultivation time is decided by the District Secretary at a meeting with agricultural officers. Their decision is based on the water availability in irrigation tanks to release water without considering rains. The procedure delays the cultivation and wastes valuable water that could have been saved for Yala cultivation. This process has resulted in a number of issues. Some elderly farmers cultivate traditionally with the first rains, are least affected by pests and diseases, also their crop becomes mature with the dry period in January. Late cultivators face number of problems, as young rice plants get inundated under heavy rains, shortage of irrigation water at the latter period, as irrigation being curtailed for mature crops, thereby affecting plants still needing water. In addition, they would be subjected to high volumes of pest attacks. The Daily Mirror news item showed a crop expecting harvesting by end-March. This paddy field would have been planted only in early December. This season most rains ended up early December. Farmers were lucky as Moragahakanda supplied water had filled all tanks in Polonnaruwa District without any shortages. But the pests and worms would multiply in numbers moving from one field to the other. In addition, when early farmers engage in Yala cultivation in March, pests from late cultivators would be waiting. Resulting farmers needing to use heavy quantities of pesticides. Current cultivation practices necessitate usage of heavy quantities of pesticides and fertiliser by farmers. Currently, most farms are small, two-and-a-half acre plots allocated in farm settlements half a century ago, have got subdivided with increasing family numbers. Farmers tend to use the entire pesticide bottle, even when only a part is required and throw the empty bottle into the waterway. This has resulted in excessive usage of pesticides, along with fertilisers. Most fields are laid in cascade fashion and excess water flows to the sown-stream paddy fields and back to irrigation canal. Canal waters are used by farmer families for day-to-day consumption. This intake of excessive chemicals is the primary reason for kidney disease prevailing in the north-central country. Excessive usage of pesticides and fertiliser has polluted the streams carrying water from fields, small fish as handaya, kavaiya and pethiya, common decades ago, have all disappeared. In addition, unnoticed by most, birds and bees too have disappeared from the area. If the birds continued they would have consumed some of the worms and their spread would have been controlled. Our agricultural officers complain B-onion seeds produced locally are poor in quality. In other countries beehives in boxes are placed among plantations, enhancing pollination. The writer has observed in North India beekeepers in small vans park their vehicle by the flowering plantations, possibly at the request of plantation owners, leaving bee-boxes on the ground. Meanwhile, keepers sell their bee honey. The biggest problem faced by the paddy farmers is the difficulty in disposing of their crop at a reasonable price. During the past few weeks, media has been reporting on farmer protests over difficulties faces due to absence of a proper buying price and demand a reasonable price. A Cabinet Committee recently decided to pay Rs. 38 for a kilogram of Nadu (long grain rice) and Rs. 41 for a kilogram of Samba. Paddy Marketing Board Chairman Kasthuri Anuradhanayaka noted that these prices have considered farmers’ operational cost and the selling price to consumers. He noted PMB has opened all paddy stores and are ready to purchase paddy. But farmers claim they sold Nadu for Rs. 45 and Samba for Rs. 50 in 2015 and demand Rs. 55 for Samba and Rs. 50 for Nadu. Meanwhile media reported of a new rice formula arrived at a recent meeting between Agriculture Minister P. Harrison and representatives of mill owners and farmers associations. According to the agreed simple formula, when the purchase price of a kg of paddy is Rs. 10, the wholesale price of a kg of rice is to be Rs. 24 and to be retailed at Rs. 28. Based on the above, if Nadu is purchased at Rs. 38 per kg, wholesale price would be Rs. 91.20 and the retail price Rs. 106.40, a price very much higher than the current market, meaning the Minister is looking after some other interests. Purchase price of paddy by the Paddy Marketing Board has been changing over the years. Given below are prices paid by PMB for long grain paddy (Nadu) produced to their standard. President Sirisena took oaths on 8 January 2015 and the Government took steps to increase salaries of Government servants by Rs. 10,000 a month and the increase with arrears was paid prior to Sinhala New Year, which created the need for infamous bonds. President Sirisena addressing the public declared that although the public servants salaries were increased, he did not forget the paddy farmers and proposed to increase the minimum purchase price of paddy to Rs. 45 for Nadu rice. Prior to the President’s announcement, white rice and Kekulu (lowest priced rice) were selling between Rs. 45 to 50 and Nadu around Rs. 52. Immediately after the announcement minimum price shot up to between Rs. 75 and 80 and Nadu still higher. Harvesting of Maha season commences in mid-January and continue till March. With the President’s decree eliminating PMB from paddy purchase, private rice millers had a whale of a time. At the time PMB price was Rs. 32 per kg, but if farmers got Rs. 25 they would have been lucky. Although a large number of rice millers existed most were small and lacked finances to purchase paddy. According to ASARC Working Paper 2016/041, ‘An Analysis of the Paddy/Rice Value Chains in Sri Lanka’, of the total paddy produced in the county PMB purchases only 10% of production and 90% is handled by the private sector. Farmers face problems in selling paddy to PMB due to long queues, inability to meet quality requirements and cumbersome procedures. The paper reports paddy purchases are concentrated with top four rice mills in Polonnaruwa collecting 37% showing concentrated milling industry in Polonnaruwa. According to Department of Census and statistics 2014 Maha paddy season running from September to March 2015 harvest was 2.877 million tons. When the President announced enhanced purchase price of Rs. 45 for Nadu in mid-April, farmers had already sold their paddy to rice millers. According to ASARC Working Paper – In July 2015 (Yala harvest) the farmers were compelled to sell paddy in the open market where prices ranged between Rs. 39 a kg for the round grain variety and Rs. 28.47 for long grain variety, both were much below the guaranteed prices of Rs. 50 a kg for round grain and Rs.45 for long grain. In January 2015, beginning of Maha harvest, white and Kekulu rice was priced at Rs. 45 to 50 and Nadu around Rs.52. With the President’s announcement white and Kekulu rose to Rs. 75 to 80 and Nadu to Rs.85. Thus rice millers who purchased paddy prior to price increase would make an additional profit of Rs. 32 per kilo of rice. Paddy harvest in Maha was 2.877 million tons and the four top rice millers from Polonnaruwa would have purchased minimum 37%, or 1.065 million tons of paddy yielding 710,000kg of rice, resulting in four Polonnaruwa rice millers making an additional profit of Rs. 24.85 billion. With PMB blacklisted by the President, rice millers would have paid farmers a still lower price, purchased a higher volume and made a much higher profit. As the JVP MP pointed out local banks have denied credit to small rice millers, but supported larger millers, raising their percentages in purchases and the profits. This additional profit of minimum Rs. 24.85 billion made by the four large rice millers in Polonnaruwa is higher than the Rs. 20 billion worth bonds offered by the Central Bank in the infamous bond scam. The Colombo Telegraph article on 12 March 2015 under ‘Is the rice monopoly exempted from Yahapalanaya?’ claims President Sirisena’s brother Dudley Sirisena of Araliya Rice, with another Deputy Minister of the Rajapaksa Government, Nipuna Gamlath, finally became a duopoly controlling paddy price to the detriment of farmers in Anuradhapura and Polonnaruwa. In August 2018, in a full page advertisement in local English newspapers Araliya Group announced its ‘Araliya Green City Hotel’ in Nuwara Eliya achieved five-star status, within one year of operation. News media also reported that the hotel owner Dudley Sirisena boasted that by end of 2019 he would have 1,500 hotel rooms under him, the highest hotel room ownership under a single owner. But he seems to be a selfish person, as President Sirisena informed at a public meeting that “my brothers won’t give me even five rupees”. The paddy cultivators have made the country almost self-sufficient in rice, but are in a pathetic situation. They cultivate under difficult conditions with changing weather, with fertilisers not received on time, pests and marketing problems. Also the paddy farmer has become lazy, with field preparation and harvesting done with hired machinery. With more time on his hands his expenses have gone up, he also needs to pay for machine hire. After harvesting the farmer needs sufficient storage space at home. For paddy to be acceptable to PMB, moisture content needs to be reduced to 14%, achieved generally by drying on the roadside. Finally, staying in line with paddy possibly over days on a hired vehicle. Once delivered payments may take weeks. Meanwhile, middle-men purchase paddy off the harvesting machine and the payment is immediate, but at a much lower rate. The poor farmer already in debt without money to pay the harvester has no other alternative. The worst was in February 2015, at the peak paddy harvesting time, President Sirisena prevented PMB from entering the paddy purchase market, making way for large rice millers to purchase at a still lower price. The farmer is at the receiving end of climate, pests and worm attacks and worst are the political worms.